Genre: Racing. Other versions: PS3; PC. While some developers opt for sequels when they’re ready, others crank out spin-offs to whet fans’ appetites in the meantime. 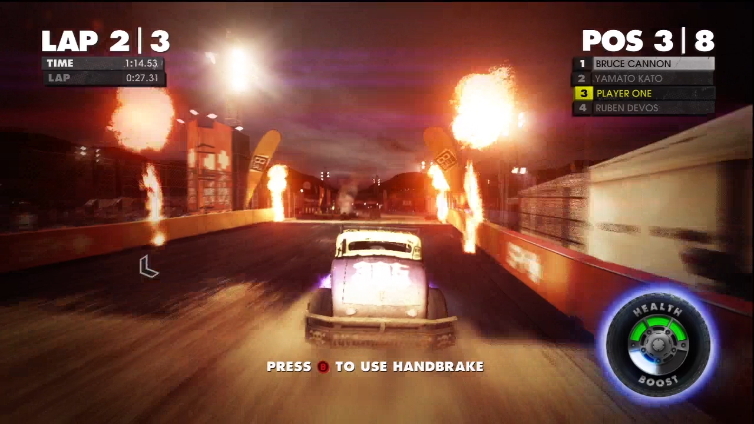 Dirt Showdown, the newest racer from Codemasters, attempts to do just that. Putting more of a focus on arcade handling and destructive events, this translates to a solid if sometimes irritable experience with some moments which will impress and other times where you’ll tear your hair out. But the main – and ultimately, crippling – problem with Dirt Showdown is that it feels like a stripped down version of its predecessors, offering significantly less content than even the short-lived Dirt 2. You won’t spend more than 10 hours playing before you’ve seen most of what Showdown has to offer. 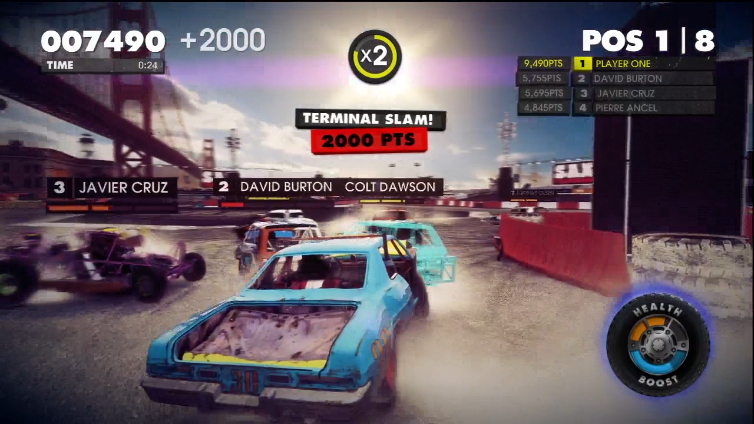 With Showdown, things like the racing line, difficulty modifiers and real-world cars have been removed for a more arcade-styled experience. Now, cars have both health and boost. The addition of boost harkens to something like Burnout, adding a bit more speed to the proceedings. This arcade feel brings the best damage-modelling system implemented into the series. Seriously crunchy cars break down at an alarming rate, and it makes the destruction-based events much more satisfying. General racing fares okay, but the handling is both shallow and frustrating. Corners require little effort to pass, but light physics mean your car is prone to spinning out, and because the rewind function is disabled in most events, this can be irritating as hell. The small number of drivers on the track also diminishes the carnage, but otherwise racing is fun. A majority of Showdown’s content comes from Tour mode. Divided into four tiers, each has about 13 events. There are fewer event types than ever before, with some events cut and new ones introduced. 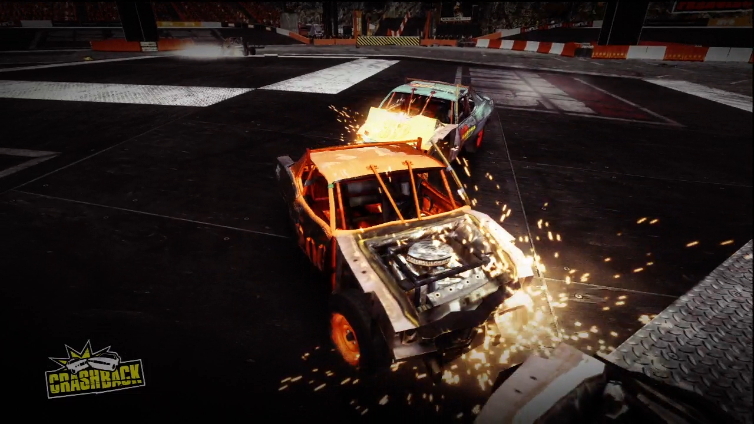 Along with standard racing – including Eliminator and Dominator variants – there are also Destruction and Trick-focused events. 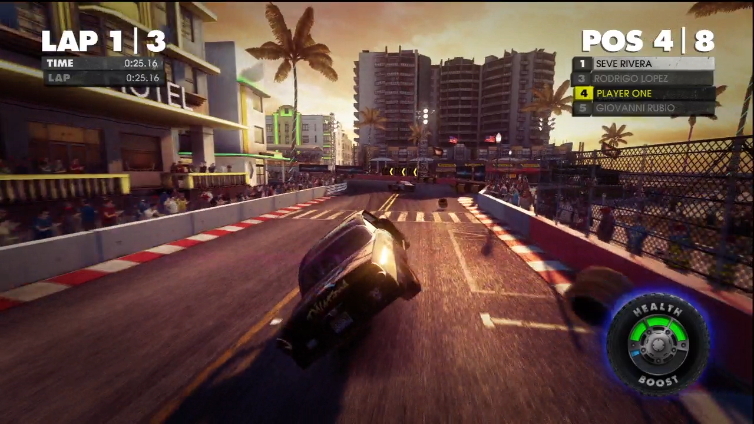 Hoonigan events mostly borrow from Dirt 3’s Gymkhana events though, meaning it feels like retreading old ground. The lack of event types cause repetition, meaning the Tour lacks excitement as you progress. Not that it lasts long enough to cause serious headaches, as most will plough through Showdown’s tour mode in little over five hours. And because earning income is removed once you earn 1st on events, the Tour loses any appeal. Outside of that, very little expands the replay value. The Compound missions return, but this mode is ruined because of two problems. 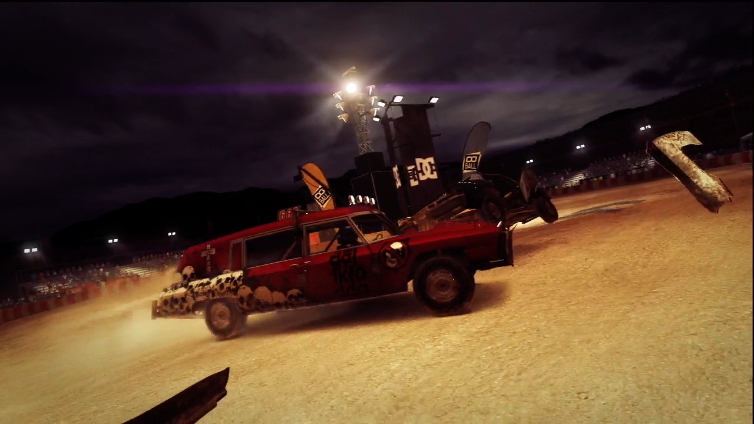 Half of the mode is recycled stuff from Dirt 3, meaning it’s not as exciting to play again. The other area is new, but objectives are now pointed out to you, meaning exploration is non-existent and the mode becomes dull. Multiplayer is here too, but feels pretty standard. 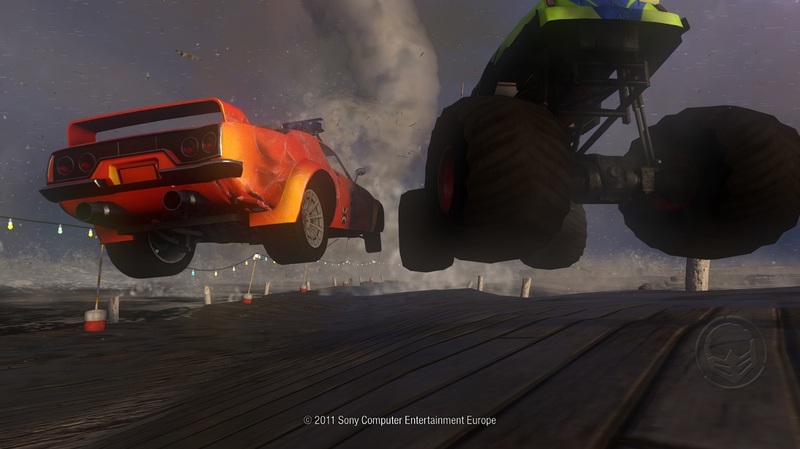 Destruction Events suffer from some lag, causing cars to teleport around the arena, and this takes the fun out of them. The competitive racing works, but the handling causes much bigger headaches here as aggressive drivers come out on top over those who drive cleanly. Both solo and multiplayer suffer because of not only dull, unexciting track design but a lack of tracks too, meaning you’ll grow tired of the same few locales pretty quickly. A case of "four wheels good, two wheels better"
At the very least, Showdown looks pretty. The series’ trademarks – beautiful car models, fantastic lighting and cool weather effects – remain intact while the aforementioned destruction system is exciting to watch, even if some oddities such as stubbornly stuck bumpers detract. It’s not a major leap above Dirt 3, but that game was so technically strong it is not a huge detractor. The sound, on the other hand, doesn’t fare as good. Granted, racing is awesome as usual, with great engine noises and some hard-hitting crashes, but everything else is a little flat. The soundtrack feels no different to the previous game, and mostly features a list of bland artists. The commentary, however, is the worst offender. All races feature commentary from Christian Stevenson, and it has to be some of the most painful I’ve heard in a long while. From cringe-worthy quotes such as “Ram, bam, slam, thankya ma’am”, it’s bro-fist commentary at its worst: and the cruel part is you cannot mute it. It’s admirable that Codemasters have tried to shake up the series, and though it’s not perfect, the arcade-styled racing is fun. 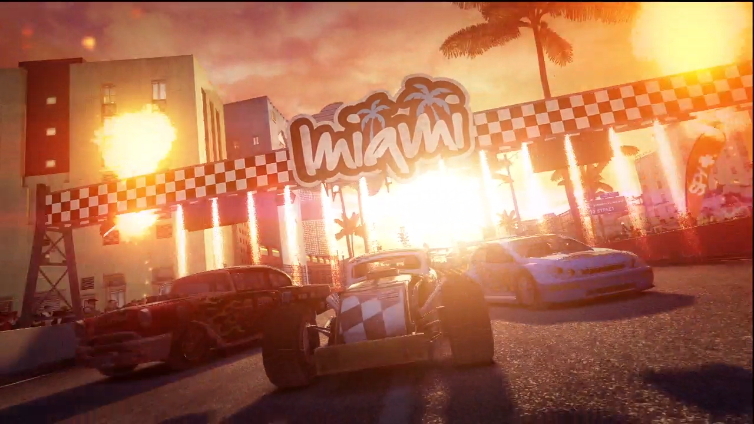 But the lack of effort in creating a sustainable experience shows: Tour mode can be breezed through in little over 5 hours – and gets repetitive in the meantime – while Joyride and Multiplayer aren’t enjoyable enough to push your gameplay time over 10 hours. It’s so brief an experience that it’s almost insulting, meaning it’s difficult to recommend Showdown as a full purchase. It’s got its share of fun moments as well as irritations (Christian Stevenson being the most irritating, of course) but the fact you get so little gameplay time means it pales in comparison to both its predecessor and competitors like FlatOut. 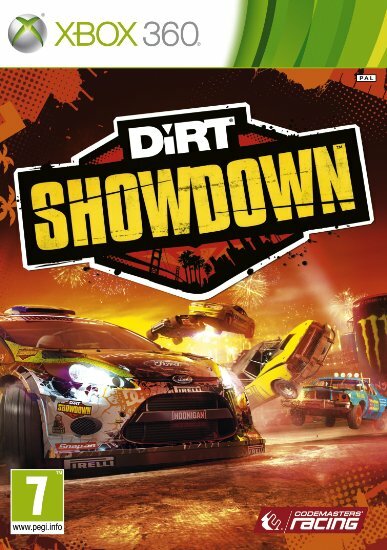 Maybe with a few more modes, tracks and cars, Showdown could have been a showstopper, but instead it’s merely average.